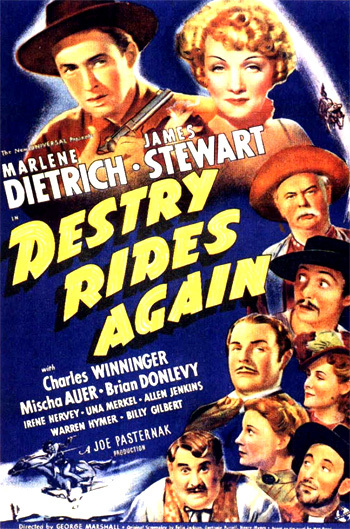 Destry Rides Again (1939) is a popular and marvelous Western comedy spoof/farce from Universal Pictures. Director George Marshall parodies and satirizes the classic Western with its stereotypical elements - a lawless Western town with a saloon and a sheriff, with three saloon/musical numbers! The film's well-paced, brisk screenplay by Felix Jackson, Gertrude Purcell and Henry Myers was based on Jackson's original screen story, suggested by Max Brand's novel of the same name. This pulp story was filmed multiple times; first released in 1932 with legendary star Tom Mix in his first sound picture, and later in 1954 with Audie Murphy. The Western film genre was a first for both James Stewart and Dietrich - in a perfect example of inspired casting and image reversal. Stewart plays the role of an atypical, pacifist, unarmed Western hero and the usually glamorous seductress Dietrich is a sultry saloon entertainer-trouper post-von Sternberg. It was Dietrich's first film after becoming an American citizen - and appropriately, it was an American western. The film lacked a single Academy Award nomination in one of filmdom's most famous years. In the film's pre-credits opening sequence, a sign reading "WELCOME TO BOTTLENECK" is shot up. Bullets smash a whiskey bottle next to the sign and another one that is tied and hanging from the sign. [A real bottleneck is left swaying.] The camera pans right across a 'Boot-Hill' cemetery and scenes of the brawling, wild frontier town of Bottleneck, characterized by fist fights and lawlessness. The credits play, accompanied by Frank Skinner's thrilling stagecoach music, ending with a view of the LAST CHANCE SALOON. There is complete mayhem in the wicked town - raucous riders shoot their guns into the sky and gallop on horseback into the gambling bar through swinging doors. In a series of economical shots in the film's first few minutes, most of the major characters in the cast are introduced or glimpsed. A crane takes the camera up above the front porch into a dissolve through the lighted windows on the second floor, where a crooked card game is in progress. The saloon's owner is gambler and slick rogue Kent (Brian Donlevy) - his face obscured by his tilted hat, setting up a rancher/farmer named Lem Claggett (Tom Fadden) in a poker game. Kent deals himself out of the next hand after losing - a calculated move, and wanders around on the upper interior hallway of the saloon - his steely-eyed dominance and control of the saloon are evident. He hits the agitated bartender Loupgerou (Billy Gilbert) on the back of the head with a half-eaten apple, signaling him to notify his star attraction to join him upstairs. The camera pans down the long bar, first hearing the famous Dietrich voice. It finds the back of lusty, tawdry, saloon singer and hostess/bad girl Frenchy (Marlene Dietrich) - she turns to face the camera in a close-up. Responding to Kent, she winks at him - and at the camera, and rolls her own cigarette. She is already singing the rousing Western number "Little Joe the Wrangler" with a whiskey, monotoned, deep-throated voice - a ribald elegy for a unlucky cowboy. But the sheriff got him quicker - yeeha! And you'd always hear him screamin' - yeeha! Till he met up with their husbands - yeeha! After belting out the song, Frenchy demonstrates how she answers to no man - except Kent. She throws a glass of whiskey into the face of Russian emigre Boris Callahan (Mischa Auer) after he appreciatively slaps her fanny. He reacts positively by nibbling on the wet liquid on his face and lips. Further along, she pushes aside another boisterous dancer. She moves across the room to town drunk and banjo-player Washington Dimsdale (Charles Winninger), who is so soused that the first view of him is of his hand grasping to steal a bottle of whiskey from underneath a table. When the town's rumpot is detected, he proceeds into an innocent-sounding reprise of the Little Joe song. The black top-hatted, corrupt, tobacco-chewing town Mayor Judge Slade (Samuel S. Hinds) who plays checkers with himself, observes the action. Kent: Well that does it. This gives us a solid strip of land right across the valley. Frenchy: And what do we do now? Cowboy: Nothin', until those cattlemen try to drive their herds through without payin'. Bugs Watson (Allen Jenkins): How many steers will come through? Kent: Last year, there were 350,000. Now if we charge 'em twenty-five cents a head, that makes...$87,500. Kent: (as he grabs the paper) I'll take care of that. Frenchy: (She takes some gold coins from the poker game and drops them down the front of her dress.) I'd rather have cash - in the bank. Frenchy: I still serve the best coffee in Bottleneck. Slade: What did Keogh have on his mind? Frenchy: Oh, he was just getting a little curious about that real-estate business. Frenchy: I think you'll have to buy yourself a whole new sheriff - if you can find one. Clara: What's comin' up? A new gold rush? Frenchy: We never got anything like that in New Orleans, did we? Clara: Maybe so, maybe so, but it was a heap more peaceful. I'd like to sink my teeth into some good ol' Louisiana oysters. The longer they wait, the better they like it. Respectable as can be. Yet here's what they say to me. You've got that look, that look that leaves me weak. You with your eyes-across-the-table technique. But oh what's the use when you know I love it. During the song, the camera cuts back and forth between close-ups of Frenchy and a sexually-excited Boris. At one point, his eyes roll upward into his head and he embraces a wooden post next to him. Later, he sprays a deck of cards and kisses the post, and then appears embarrassed by his ejaculatory responses. Further evidence of her turn-on power is exhibited when an excited admirer fires both his pistols into the air. In a politically-sounding announcement, Kent has arranged for the criminal Mayor to nominate/appoint hard-drinking Dimsdale to be the new sheriff for the now-vacant position. Fellow citizens, our esteemed sheriff, Mr. Joseph Keogh, has been suddenly called out of town on urgent business. He'll be gone permanent. So it becomes necessary for me to appoint somebody to fill out the unexpired term. Therefore, with the power conferred on me by Statute number 85-E and other statutes thereunto appertaining, I do hereby appoint to the post of Sheriff that paragon of courage, that credit to his community, the pride of Bottleneck, Mr. Washington Dimsdale. I set 'em up and you drink 'em down. I set 'em up and you drink 'em down....(A cut-away to a befuddled Dimsdale)...This is getting monotonous. Dimsdale: Shut up, you fools. But I'm tellin' you, this town of Bottleneck has gotta respect law and order or I'll put everybody in jail. Slade: The Sheriff's right. Now you can see why I chose such a strong-minded man. Kent: We're all with ya, Sheriff. If you need any help, I'll be your deputy. Dimsdale: I want a deputy like I was when Destry was my boss. Why we handled a much tougher and ornery crowd than I see present. Why when we started shootin', they ran out of town so fast, the breeze from their coat-tails set off a scythe of a windmill. Frenchy: But Destry is dead. Cowboy: That makes him the right man for the job. 2nd Cowboy: Saves us a lot of trouble. Dimsdale: Is that so? Well, young Tom ain't dead and his father brought him up to be the toughest and fighting-est man that ever growed up in the West. He ain't got as big a name as his pa, but he cleaned up Tombstone. And I'm sendin' for him to be my deputy. And when he gets here, Destry will ride again! The scene cuts to pairs of running horses' legs, attached by harnesses to a rumbling stagecoach on the way to Bottleneck. Inside the Pioneer Stage Line coach is Thomas Jefferson Destry (James Stewart) [a reference to the famous 3rd President and to the recent role Stewart had played in another 1939 film Mr. Smith Goes to Washington - Jefferson Smith], the son of a legendary frontier peacekeeper, called upon to help him tame the town as the new deputy lawman. The pleasant young man spends his time carving wooden napkin rings as a hobby to calm his nerves: "You'd be surprised at the genuine rage you can work off just by carvin' a little piece of wood like that." One of his fellow passengers, a cattleman named Jack Tyndall (Jack Carson) is baffled by the unarmed deputy's pacifism: "Are you sure your name is Destry?" It's a common question for the namesake of the famous deceased lawman: "Folks is always askin' me that."